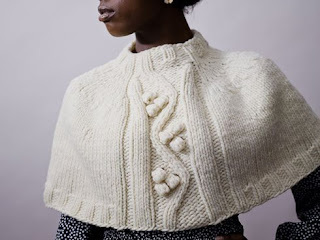 Kristen TenDyke's Blog: New Knitscene, Winter 2012 designs! Have you seen the Winter 2012 issue of Knitscene? In it you'll find two of my designs—the Friday Slippers and the Trillium Capelet! 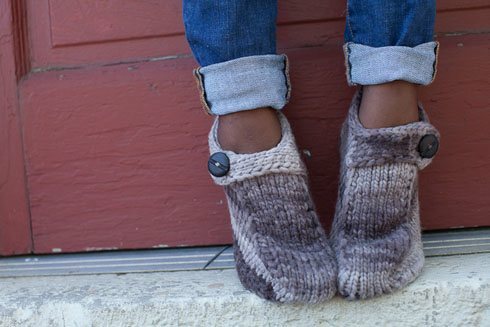 Join the KAL on Ravelry! Sizes 8½ (9, 9½ )" foot length, to fit woman’s U.S. shoe sizes 5–7 (7–9, 9–11); shown in size 9"
Yarn distributed by Tahki-Stacy Charles Inc.
Sizes 47 (55½, 61)" lower edge circumference, 15¼ (18, 18)" neck circumference; shown in size 47"
Woman’s capelet knit from the top down with cables and short-rows in a singles yarn.